Nowadays fashion is a lot more readily available to us, literally at our fingertips. As Instagram and online content continues to grow, it’s never been easier to keep up to date with the latest styles and trends. Whilst the digital world continues to grow, and also help fuel my fashion cravings, I love nothing more than to go into a store, be able to try things on and see clothes’ textures and materials in their physical form. Admittedly, the majority of my shopping trips consist of me throwing a strop at not being able to find something I like/that suits/that fits. I find shopping for men’s clothes a much more calm experience. This is probably because my other half magically (and annoyingly) manages to find a tonne of nice clothes in a fraction of the time that it takes me to find one nice top. This week I was invited to go along to the opening of the new Tessuti store in Chester and check out what styles it had to offer. The new store is located on Bridge Street, not too far away from its sister store. I went along with my friend Lee and straightaway we were instantly drawn to the Vivienne Westwood collection. Vivienne Westwood is undeniably one of the most influential designers of all time and her pieces never go out of fashion. A piece by Westwood is an investment, and I even wanted one of these incredible jumpers for myself. You can find a vast selection of brands in the store, from Ami Paris to Moschino, to my favourite collection by Neil Barrett, which had the fantastic bold lightening bolt print. 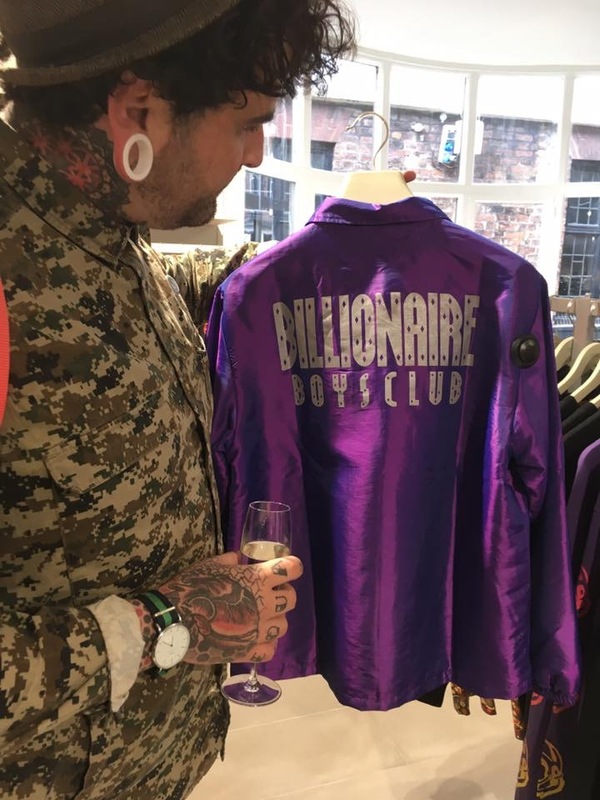 This Billionare Boys Club jacket Lee nearly had home with him! The store boasts its clothes across three floors, not forgetting Northern Barber Company on the second floor. More places definitely need to adapt this concept: get your outfit, hair done, Saturday night sorted. Tessuti caters for all styles and ages, as on the top floor you’ll find the children’s section, which also hosts brands such as Moschino and Hugo Boss. Head over to the new Tessuti store to have a look at their impressive selection of men’s clothing and shoes. You can also find them online here.